The basics of Traditional Chinese Medicine (TCM) theory were first laid down in print approximately 2,300 years ago in the Yellow Emperor's Classic of Internal Medicine (Huang Di Nei Ching), after a long period of development in China. The book has ever since been regarded as the "bible" of TOM, always studied and referenced frequently. TCM spread throughout the region over one thousand years ago. As each ethnic culture gained access to TCM, they adapted it to their own ways, developing variations and specialties, and utilizing local herbs and other healing methods. For example, from the basics of Yin-Yang, Five Elements, Eight Principles, and other common theories, the Japanese developed an advanced system of treatment by way of the organs in the abdomen (hara), and the Koreans developed a form of Constitutional Therapy, whereby they classified people according to their natural-born imbalances. Of course, now it must be called Traditional Oriental Medicine (TOM), in light of respect for their contributions. 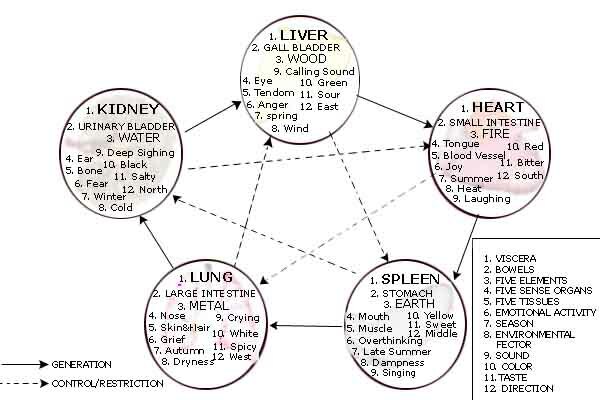 The Oriental medical system indicates that one of the five elements represents each organ of the body.five Elements present in our environment as well as our bodies. The five Elements are Earth, Water, Fire, Wood, and Metal and all have to be balanced equally in order for us to experience good health. The Earth element is present in the mind and acts as a grounding point for all experience. Our adaptability is in the Water Element and our perception and its capacities are in the Fire Element. Our continuous reproduction is Air and our unlimited strength is Metal. From the mind, the physical body develops and becomes filled with these elemental characteristics; thus forming the world’s oldest medical traditions. Today, we have a popular resurgence in Oriental medicine, thanks to interest in Holistic medicine. The Oriental origins date back to the seventh and eighth centuries. When all five elements are balanced, within the body, the body is healthy and happy. In the same way as an excess of Metal energy in your environment will depress you, an excess of Fire energy in your body causes illness. 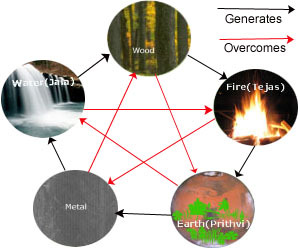 Chinese five elements theory refers to the five elements of wood, fire, earth, metal, and water. This theory can be used to describe the movement and the relationship between different elements and phenomena in nature. Yin is rest and Yang is activity. The changes to yin-yang always move in relationship to each other. The ideal is for each to exist in harmony with the other.